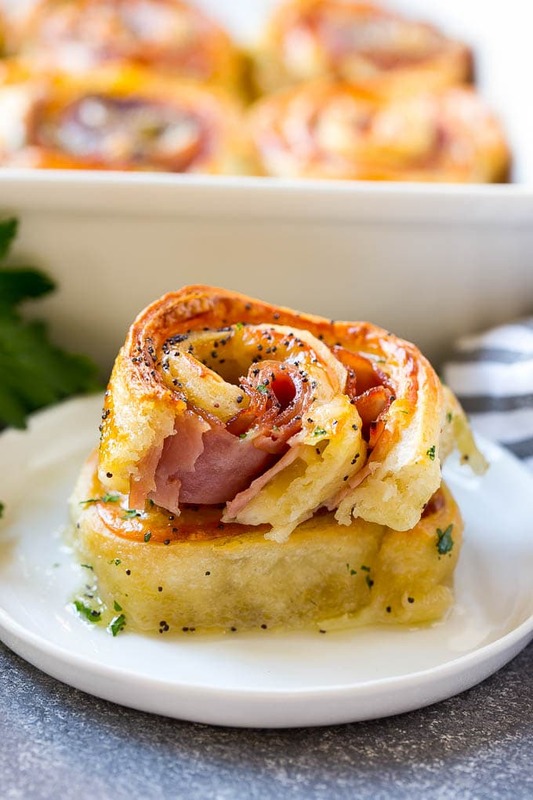 These hot ham and cheese pinwheels are rolls loaded with plenty of meat and swiss, then topped with a butter poppy seed sauce and baked to golden brown perfection. I serve ham and cheese roll ups at every party and there are never any leftovers! 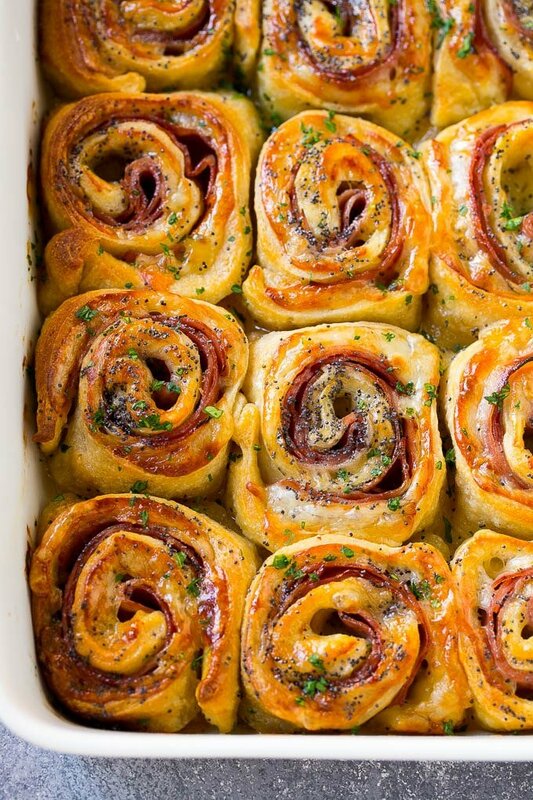 Crispy brown rolls filled with smoky ham and melted cheese, then doused in butter. How could you possibly go wrong with that? These ham and cheese rolls are one of the best things I’ve ever eaten! If you’re looking for a savory party appetizer that will keep your guests full and happy, you MUST try these ham and cheese pinwheels. These little rolls are absolutely delicious and are perfect for almost any occasion, like birthday parties, game day, or even as a main course. Best of all, they’re super easy to make with just a handful of ingredients. To make these ham and cheese roll ups, you’ll need pizza dough, ham, swiss cheese, butter, brown sugar, mustard and poppy seeds. The pizza dough gets rolled out into a rectangle, then is layered with ham and cheese and rolled up, jelly roll style. From there all you have to do is cut the loaf into slices, smother with the butter mixture, then bake. The end result is gooey, cheesy perfection. I use a can of pizza dough for this recipe because it already comes shaped like a rectangle and is super easy to roll out. You’ll want to use very thinly sliced ham and cheese here so that you can tightly roll everything up. 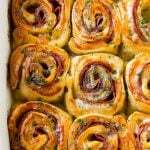 What I love about this recipe is that there’s just 10 minutes of prep time, but you end up with a whole pan full of delectable rolls that’s perfect for serving a crowd! What’s your favorite party appetizer for easy entertaining? I’d love to hear your answer in the comments! Unroll the pizza dough onto a non-stick surface and roll it into a large rectangle, roughly 13"x8" in size. 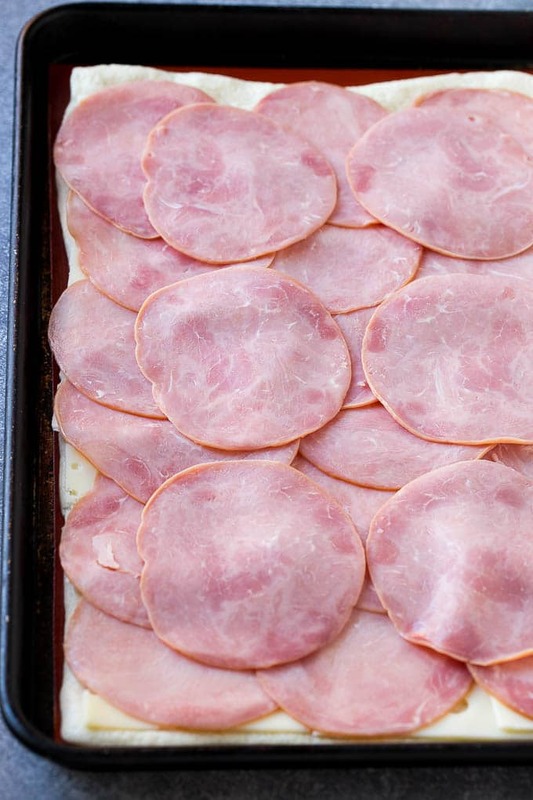 Layer the ham on top of the pizza dough to cover it completely, then layer the cheese in the same fashion. Cut the loaf crosswise into 12 equal sized pieces, then arrange in the prepared pan. Whisk together the butter, brown sugar, Dijon mustard and poppy seeds, then pour evenly over the rolls. Bake for 25-30 minutes or until golden brown. Sprinkle with parsley if desired, then serve. You can also make this recipe with crescent roll sheets instead of pizza dough, use 1 1/2 of the 8 ounce cans. Sesame seeds are a great substitute for poppy seeds for a little different take on things. The rolls can be stored unbaked for up to 24 hours in the fridge, simply cover with foil and then bake them when you're ready. These were awesome! I made them for Christmas Eve and everyone loved them. Do you think you could sub pie crust for pizza crust? I have some pie crust, ham, and cheese left over and am not sure what to do with it! Yes I think that would work, but the pie crust won’t puff up and expand the same way pizza dough would, so just keep that in mind when you’re spacing them out in the pan! Can you make the day before and heat the next day? I would wrap up the ham and cheese in the dough, then cover and refrigerate. Pour the sauce over the top right before you bake the next day! If leaving in fridge to bake in morning, do you pour sauce over then cover and put in fridge or pour sauce over just before baking in morning? I would pour the sauce over just before you bake them, since the sauce is butter based it will congeal in the fridge! 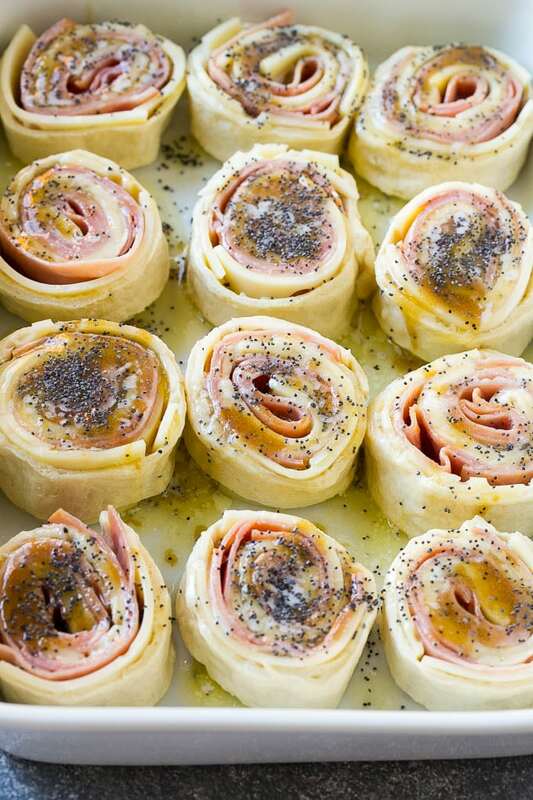 Those ham and cheese pinwheels look so delicious! I will save this recipe and make some with whatever ham there is left over from Christmas! 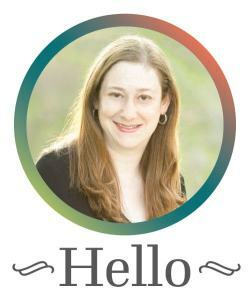 Now that the kids are older, they’re branching out and eating new foods. It’s been so fun sharing recipes with them and this looks like one they’ll love! I ended up without a whole lot to have to bring for family holiday dinners this year. I’ll make these sandwiches and surprise everyone! Love the flaky crust! This dish looks super delicious! I am definitely going to make this! This looks really delicious! I would love to try this! These look so good! 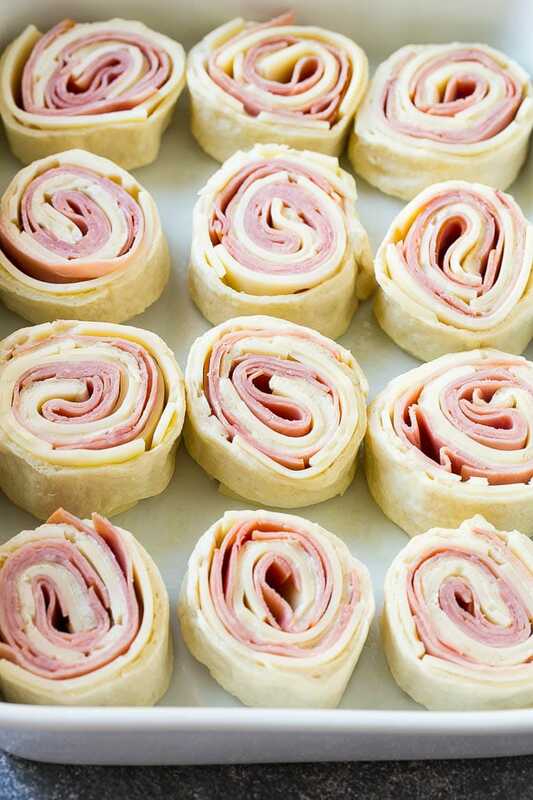 I love ham and Swiss cheese together, so these pinwheels would be really good. I think this is an awesome recipe because it can be eaten at any time of the day! It’s perfect for parties and game days as well. It’s definitely a keeper! These look incredible! I am definitely making these over the holiday. I just had bacon wrapped chestnuts, and I think those are my favorite appetizer now! I am going to a potluck on the weekend and this sounds like something all the guests will love. I love the combination of ham and swiss cheese. Oh what a treat! I can practically taste those flavors already. These look absolutely delicious. We love to have brunch for Christmas. By the time the kids have done played with their toys, it’s around brunch time. These will be perfect! Delicious. This is something I could serve and I’m sure the whole family would enjoy. Those look so good! They’d be perfect for appetizers or a tasty, fun breakfast. I can’t wait to make these. These will be great for Christmas breakfast or brunch. So simple to make, and they look tasty.